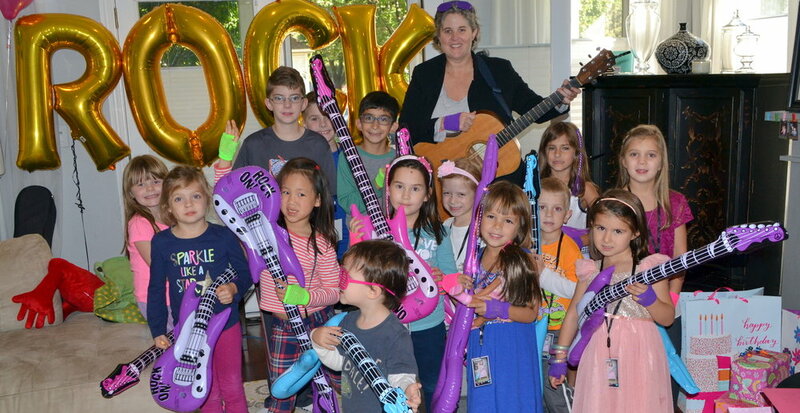 Laura's rockin' birthday parties are a 45-50 min. fun-filled singalong, complete with a special Happy Birthday song for your little one. Laura brings shakers for the kids to play, along with a visit from her puppet friends Domingo the Flamingo, Pinky the Fish and Jazzasaurus the baby dinosaur. A small PA system is provided for a "concert-like" show in your living room (for parties over 10 children), or the show can be unplugged for a more intimate setting. Laura's CDs make great party favors. Purchase autographed CDs for your party guests at a discounted rate - 50% off! Book Laura for your holiday or Christmas party event. She'll play all the holiday favorites. Folk/Rock/Pop Cover Set - Want Laura to stick around and play a set for the adults too? Laura's got everything in her songbag from 60s/70s/80s classic folk and rock tunes to current hits in folk, rock, and pop music. Beatles, Fleetwood Mac, Rolling Stones, Simon & Garfunkel, Grateful Dead, Indigo Girls, Bruno Mars, Neil Young and more, and even a few golden oldies and jazz standards for the grandparents! Additional Band Members - You can book Laura along with one or more of her Heartbeats band members.